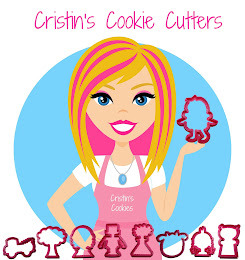 Cristin's Cookies: Ordered Kitchen Aid Mixer FINALLY - guess which one? Ordered Kitchen Aid Mixer FINALLY - guess which one? Notice all those jars with tons of sanding sugar for cookie decorating (thanks for the tip Callye!). Those all have silver lids. Oh but notice those pretty pink plates. Still not getting anywhere... see why this has taken me so long to make a decision? These are the cupboards I use to store my 316 cookie cutters. Hmm lots of pink and no silver here (although there are some tin cookie cutters in the drawers). I count 9 pink arrows and 4 silver arrows. Yep, you probably guessed right. 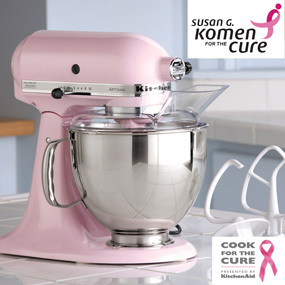 I decided on the PINK Kitchen-Aid 5 quart mixer. I know a lot of people said to go for functionality over color, but those that truly know me said that if I don't get the pink one now, I'll never stop drooling over it. They were right. I'm so excited!!! And part of the proceeds go to support the fight against Breast Cancer and we all know how I feel about helping those that fight the good fight against Cancer! You are so pink! I think of you now when I see pink. Oh Cristin! How did that singer get the name Pink. You should have it! 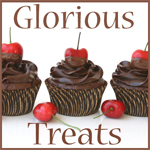 @Kathy Bulmansorry trying to leave a reply on your comment: Thanks Kathy! I love the singer Pink! When she first started out, she had all pink hair. Her latest song "Perfect" is top on my iPod playlist. I was thinking of you this afternoon. I hope all is well! @Yamini Thanks Yamini! You're such a great friend!